I once went to Barcelona with my family for a Christmas holiday. We never went on holiday over Christmas but just once the parents decided to try something new. In the spirit of true moody-teenagerhood, my only memories of this trip are that a) it was far too hot for the holiday season (tip: if you’re sweating, it’s too hot for Christmas) and b) paella. Paella paella paella. Everywhere I turned. I did. not. want. to eat freakin’ paella. So mostly I ate pasta and ice cream. But then a few years laters I was working as a lowly waitress at a New Year’s Eve party and they were serving churros with chocolate sauce. I was curious – and hungry; I hated working late because it messed up my eating patterns – so while I was clearing away plates, I snuck off and hid behind a curtain (yes, I really did) and tried one that was left over on a plate (I grew up on a farm – I have no scruples when it comes to eating off other people’s plates). And in that moment I knew that I had left Barcelona without trying the one thing I should have: churros + chocolate. 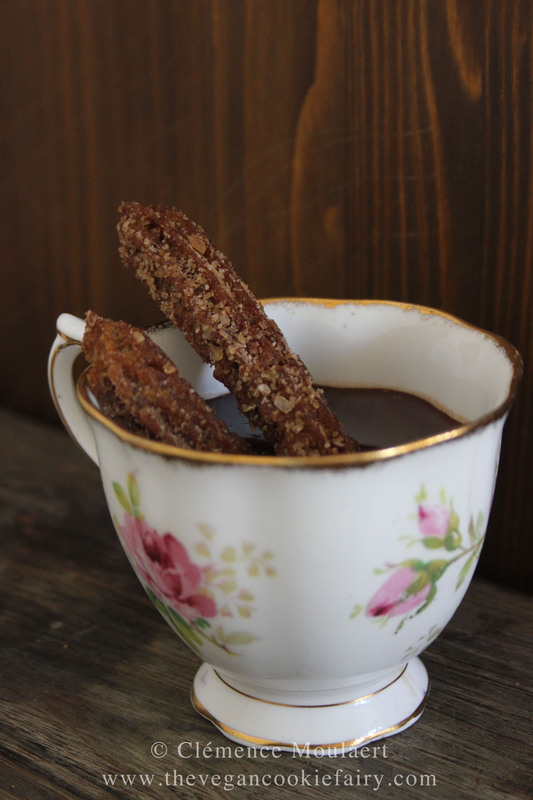 But, without meaning to sound completely full of myself, I think this version beats traditional churros. I make no claims that this recipe is healthy – because a) vegan food does not necessarily equal healthy and b) coconut sugar is still sugar – I only claim that you should really try it before you die. Really. Adapted from the recipe in Jamie Magazine issue 49. Notes: I used wholewheat flour, not because I was trying to make a typically unhealthy recipe ‘healthy’, but because that is what I had at my disposal. I found it gives the recipe a richer flavour and goes well with the butterscotch flavour of the coconut sugar, so I recommend you try it for yourself. Place a small saucepan over medium heat and add the milk, butter and water to it. Let the butter melt into the water and milk; as soon as the liquid starts bubbling up remove the pan from the heat and pour into the bowl of dry ingredients. Fold the liquid into the dry ingredients; the batter should be even and smooth but also fairly thick. Pour an inch or so of oil into a large, deep frying pan over medium heat. Drop a cube of bread into the oil to test the temperature: if the cube of bread turns golden in 60 seconds, the oil is hot enough. Also prepare a large plate with paper towels and another with the cinnamon and coconut sugar. Put the churros batter into a piping bag with a large star-shaped nozzle. Squeeze out some batter – about the length of a finger – into the hot oil, cutting it off from the piping bag with a pair of scissors. Do this for about 5 churros at a time. Fry them for about a minute, or until they start browning and looking crisp, then fish them out of the oil with a sieve or slotted spoon. Dry them off on the paper towels and immediately roll them into the coconut sugar. Repeat this process until the churros batter is all used up. 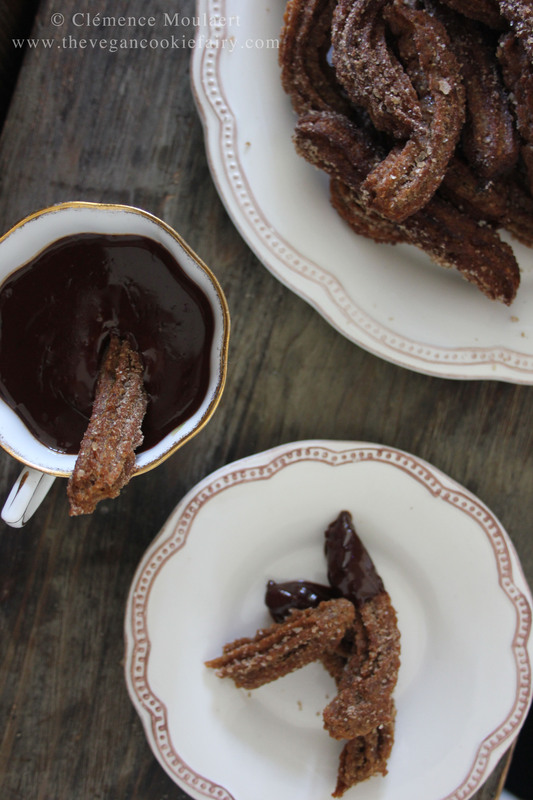 Make the chocolate sauce (below) and serve immediately with your churros. Gently heat the milk in a wee saucepan over medium heat. Break the chocolate into small pieces and add to the pan. When the chocolate starts oozing into the milk, stir with a wooden spoon to combine evenly. 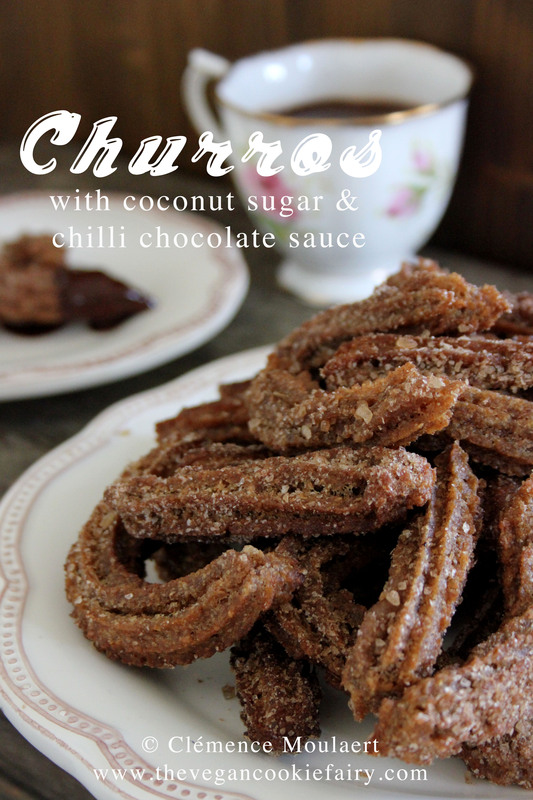 Pour the sauce into a serving dish and enjoy warm with your churros. What’s your favourite thing you’ve ever tasted on holiday? Yesssss this looks amazing! 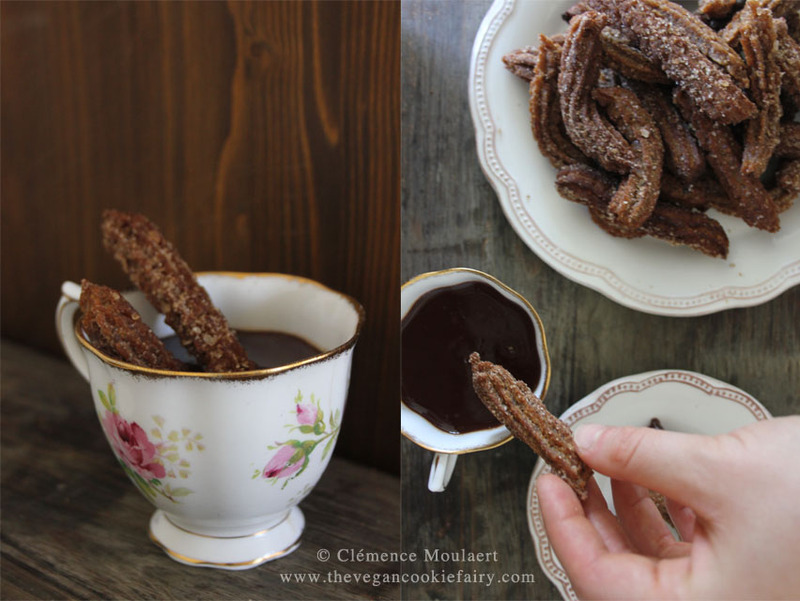 I’ve never had chocolate churros! I suspect the twigs of the Tree of Good and Evil resemble your churros, dripping chocolate dew, and if I taste one I will change the fate of all humankind. These are out of control! In the best kind of way! I’ve never tried churros, but always been curious. They SOUND delicious but have been described as “doughnut twists,” and I just don’t like doughnuts. In this day and age that makes sense as I don’t tend to like anything that’s basically just white flour and sugar, but even in childhood I just found them bland. I can already tell that just by being whole-wheat (I genuinely find that adds and enhances flavour rather than reducing it) I’d like these much more, but just for curiosity’s sake how much like doughnuts ARE traditional churros? Well, I haven’t eaten many doughnuts in my life (I will try to rectify that in due course) but I’d say the texture is comparable. Depends how crispy you make them. But because they’re fairly thin, compared to a doughnut, they didn’t feel like they were entirely doughy to me – it was a good mix of doughy and crispy, which is what I was after. The wholewheat flour does add a whole new dimension of flavour and texture, I agree! These look amazing! 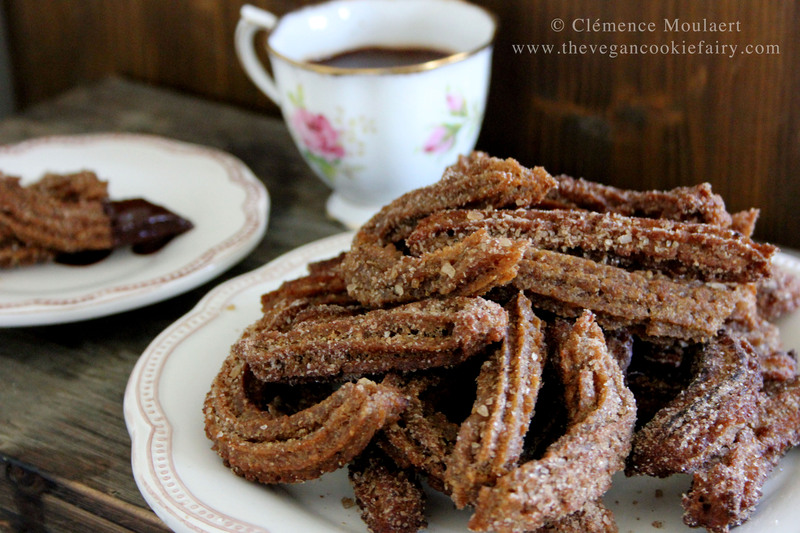 My husband grew up eating churros & I love making vegan versions for him! I will have to try your recipe!